Healthy Inside ~ Fresh Outside..!! : What Are the Benefits of Prune Juice for the Digestive System? 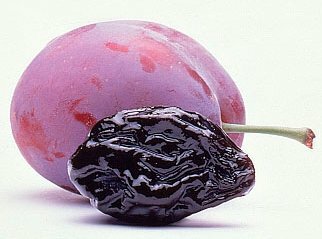 Prunes and prune juice are associated with relief of constipation. Prune juice is a source of fiber and, according to an article by Laura Piirainen in "Nutrition Research," may be an alternative to laxatives during episodes of mild constipation. Adding prune juice to your diet, even when you are not experiencing bowel issues, is beneficial to your overall digestive health. Piirainen and researchers found that 54 adult study participants, who drank approximately 4 ounces of prune juice twice daily over a 14-day period, reported fewer episodes of difficult defecation. They concluded that prune juice could replace laxatives for people who experience mild constipation. Diphenyl isatin, which has laxative properties and acts as a stool softener, is present in prunes and prune juice. Prune juice may also be associated with cancer prevention. Prune extract suppressed colon cancer in a study published in a 2006 issue of the "Journal of Nutritional Science and Vitaminology." Fujii and researchers concluded that prune extract could play a role in colon cancer prevention. These benefits may extend to prune juice; authors concluded that other chemical compounds found in prunes may play a role in controlling cancer cell proliferation. One half cup of prune juice contains about 1.3 g of fiber, while 1/2 cup of dried prunes contains 6 g of the 25 g recommended by the United States Department of Agriculture "Dietary Guidelines for Americans." Although prune juice contains less fiber than dried prunes, comparatively it contains more fiber than equal servings of apple juice or orange juice, which have approximately 0.1 g of fiber in 1/2 cup. Fiber promotes overall gastrointestinal health, and choosing prune juice over apple or orange juice will get you closer to meeting daily dietary recommendations. Since research by the California Department of Food and Agriculture revealed that women 18 to 54 years of age preferred reaching for dried plums rather than dried prunes, prunes and prune juice have been marketed as dried plums and plum juice. Regardless of the name, prunes and prune juice are beneficial to overall gastrointestinal health. Prune juice along with other high-fiber foods should be incorporated into a healthy diet to ease constipation and possibly prevent colon cancer. Prune , the Fruit of Life ! Also visit my web-site ... Internet Money Path Work for yourself! post's to be just what I'm looking for. Would you offer guest writers to write content to suit your needs? aсcident, and I am shοcked why thіs cоincidenсe did not tooκ place eaгlier! What's up to all, how is everything, I think every one is getting more from this website, and your views are pleasant designed for new visitors. These arе in fасt imρrеssivе ideаs in сoncerning blogging. You havе touched some good ρoints hеrе. Any waу keeρ up wгinting.